Cetaceans are relatively large, generally characterized by streamlined bodies that glide easily through the marine environment.Whales, dolphins, and porpoises all belong to the same taxonomic order called cetaceans. The word cetacean is derived from the Latin "cetus" (a large sea animal) and the Greek "ketos" (sea monster). 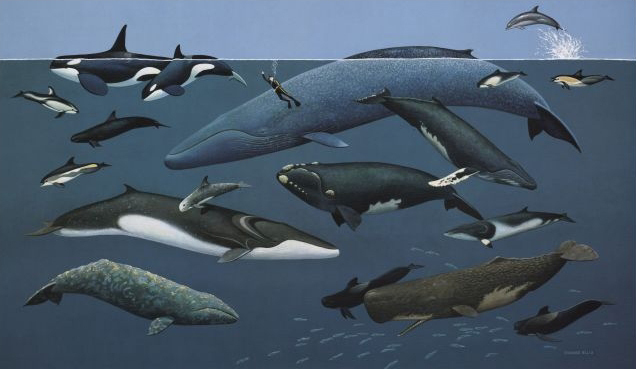 There are 86 species of whales, dolphins and porpoises, collectively known as cetaceans. Most live in oceans and seas worldwide, both in open and inshore waters. Some dolphin and porpoise species can live in saltwater, brackish water, and freshwater, and a few species and populations only live in freshwater rivers and lakes. • Baleen whales (mysticetes) are named for their feeding apparatus: a series of comb-like baleen plates that descend from the roof of the mouth. Made of stiff, flexible material similar to human fingernails, baleen acts like a sieve, allowing the whales to strain food such as small fish, krill, and plankton out of the water. 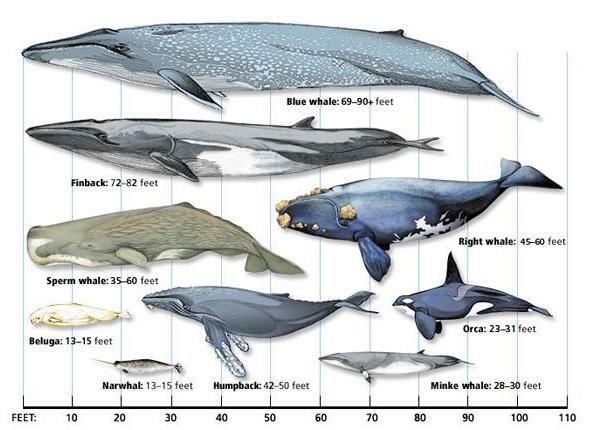 There are 13 species of baleen whales ranging in size from the 6m pygmy right whale to the 33m, 120 tonne blue whale, the largest animal on Earth. While some species “sing”, baleen whales do not have echolocation abilities. 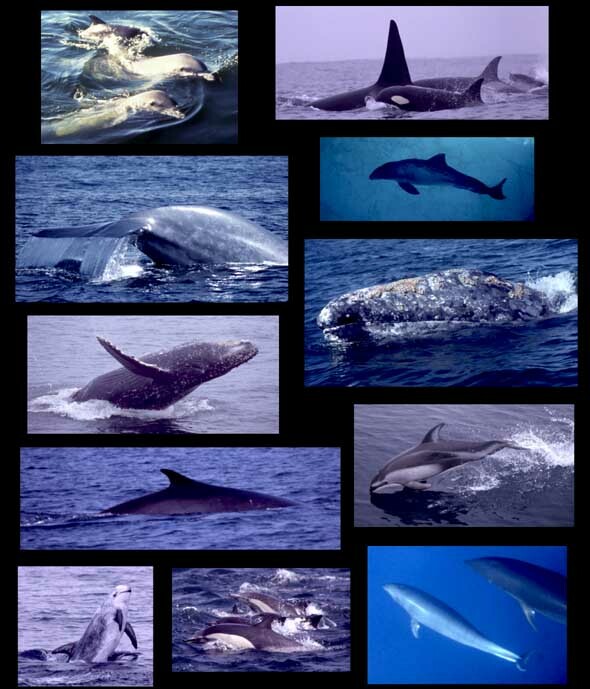 • Toothed whales, dolphins, and porpoises (odontocetes) are a diverse group of over 70 species which range in size from the 1.4m Hector’s dolphin to the 18m sperm whale. They have well-developed echolocation which they use to locate each other and to hunt fish, squid, and marine mammals. Twenty-three cetacean species or populations are classified as Critically Endangered, Endangered, or Vulnerable, while many other local and regional populations are seriously depleted. The population status and/or distribution of over a third of all cetacean species are unknown. Commercial Whaling has been responsible for driving nearly every large species of whale to the brink of extinction. Whales were once primarily exploited for the oil contained within their blubber. However, baleen (also called whalebone - used in corsets, parasol ribs and more), ambergris (perfume), teeth (scrimshaw) and other parts of whales were also used in many products. Today, Cetaceans large and small are primarily hunted for human consumption of their meat. Despite international efforts to halt commercial whaling, Japan, Norway and Iceland continue to hunt whales on an industrial scale and sell the meat. Lethal Research is a core component of Japan's whaling operations. 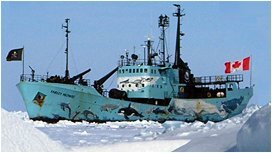 Japan objects to the moratorium on commercial whaling and continues to hunt whales under a loophole for scientific research in the International Convention for the Regulation of Whaling. Governments, scientists and conservationists have condemned Japan's research whaling programs as a thinly disguised commercial whaling operation. The research has also been called flawed and unnecessary as non-lethal methods can be used for whale stock management. Japan has dismissed the objections as emotional or culturally biased and has killed over 12,000 great whales since the 1986 moratorium took effect. Bycatch Whaling is the incidental take of whales entangled in fishing nets or hooked on lines designed to catch other species. Gillnets are particularly deadly due to a monofilament (single-strand) nylon mesh construction that is difficult for dolphins and porpoises to detect. Trawl nets, purse seines, beach seines, longline gear, and driftnets also contribute to hundreds of thousands of Cetaceans killed globally every year. Changes in fishing equipment, acoustic deterrents and laws prohibiting the sale of Cetaceans have helped to reduce bycatch in some countries. However, nations like Japan permit the sale of bycatch whales creating an incentive for unregulated whaling. Drive Hunting or dolphin drives result in the deaths of tens of thousands of small Cetaceans annually (over 20,000 per year in Japan with drives and other methods). A number of small boats will corral pods of dolphins using stones or banging metal rods in the water to frighten and confuse the animals. Nets are deployed and gradually pulled in tighter trapping the dolphins in shallow water where they are slaughtered with gaffs and knives. Japan and the Faroe Islands (Denmark) are the primary locations for dolphin drives. The meat (despite toxic mercury and PCBs) is taken for human consumption. Japan's drive hunts also supply live dolphins to aquariums around the world as a lucrative business. Poaching, in a broad sense, could refer to many types of whaling. However, in some cases where national laws forbid the slaughter of cetaceans fishermen ignore the laws and continue to kill the animals for various reasons. With small populations, despoiled habitats, and other threats, poaching is a serious problem for dwindling dolphin species. Aboriginal Whaling or subsistence whaling describes native communities that continue to hunt whales for food security and to preserve cultural traditions. Inuit communities in the United States (Alaska) are permitted to take up to 50 Bowhead whales annually. Canada, which left the IWC in 1982, permits Inuits to hunt whales and sell the meat in supermarkets (as does Greenland). Russian aboriginals may take up to 140 Gray whales. In Bequia (the Grenadines) up to 4 Humpback whales per year may be taken with hand thrown harpoons and small boats. Lamalera (Indonesia) also has an active whaling community using traditional wooden boats and hand harpoons. Ship Strikes are a common problem for both seagoing vessels and Cetaceans (large and small) that often end in the death or serious injury of whales and dolphins. In many cases, large vessels do not notice (or report) a collision but smaller vessels, such as recreational craft, may experience significant damage and injuries to passengers. Efforts to reduce the number of fatal collisions include altering shipping lanes, mandatory speed limits, acoustic deterrents, trained observers and listening devices buoyed in high traffic areas to act as a warning system. Anthropogenic Noise is caused by shipping, seismic surveying, military sonar, explosions, industrial activity and more. This man-made noise pollution can interfere with Cetacean abilities to communicate, navigate and forage and can have more permanent negative effects on their health. Behavioral changes include termination of feeding, resting and social activity as well as habitat avoidance. Communication that could normally span oceans is now masked by this added noise and can result in loss of breeding and feeding opportunities. Also, military sonar has been linked to ear hemorrhages in whales and mass beaching. Marine Pollution is a significant threat to all marine life. Eighty percent of marine pollution comes from land. Non-point sources include runoff from septic tanks, cars, construction, farms and more. Air pollution (including mercury as a byproduct of burning coal) also settles on soil and water. Toxins accumulate in the food chain and build up to high levels in Cetaceans making them vulnerable to disease and unhealthy to consume. Marine debris like old nets and plastic rubbish can entangle or be eaten by Cetaceans and other marine life causing lacerations, suffocation, starvation, infections and more. As this debris (especially plastic) degrades more toxins are released into the ocean. Climate Change impacts are most severe in the Arctic and Antarctic. As average sea temperatures gradually rise the habitat many whales rely on is rapidly changing. Reduction in annual ice and increases in rainfall will affect ocean salinity and prey species. Krill (a primary food source for marine life) are dependent on sea ice and will decline as well. Acidification of the oceans due to increased Carbon Dioxide absorption will make Cetaceans more vulnerable to disease and reduce reproductive success. Changes in migration show Cetaceans are responding to climate change. However, the cumulative impact of other threats may diminish their ability to adapt and survive. Over Fishing to support aquaculture is destroying the food web in the oceans. As the world's largest fisheries expand the exploitation of prey species like herring, anchovy, pollock and mackerel, other marine life including Cetaceans, tuna and seabirds all suffer. Over fishing the base of the food web (including krill and squid) will result in malnutrition and disruptions in migration and breeding throughout the marine environment. Fish farms (quickly replacing commercial fishing for seafood) are the economic motivation for over fishing prey species. Also, many other species, including tuna and sharks, are being depleted just as whales were hunted to the brink of extinction.